The Rocky Mountain Geographic Area Coordination center, which includes Colorado, South Dakota, Nebraska, Kansas and most of Wyoming, has estimated — as of Dec. 21 — that 5,345 wildland fires have burned 1,238,987 acres in those five states in 2012. 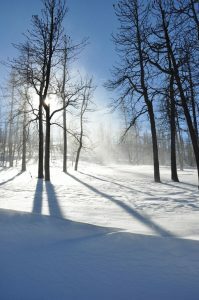 Wind-blown snow obscures the sun Dec. 20 in the Glacier View Meadows subdivision northwest of Fort Collins. June’s High Park FIre destroyed 253 homes in Glacier View on June 22. So far this year, Colorado has experienced 1,505 wildland fires that have burned 289,927 acres according to numbers on their website at gacc.nifc.gov. In Larimer County, wildland fires have burned 97,241 acres, of which about 56,000 acres were in the Arapaho-Roosevelt National Forests. These numbers don’t include wildfires reported by local fire departments. The RMACC, located in Lakewood, is a regional division of the National Interagency Fire Center which coordinates wildland fire responses and allocation of fire management resources through interagency agreements. Twenty-five percent of the Rocky Mountain Geographic Area acres burned, or about 315,591 acres, were human-caused fires. Lightning strikes caused fires on the remaining 75 percent of acreage, about 923,396 acres. Year-to-date 2012, the NIFC reported that there were 67,300 wildland fires nationwide that burned 9,208,454 acres. NIFC tracks wildland fires at www.nifc.gov.